A number of European countries manufacture military blanks and training ammunition whose cartridge cases and "bullets" are made of plastic. The blanks can be identified easily by the "breaking points" or serrated lines on the nose of the cartridge (Figure 10.18). These blanks are typically color-coded as to caliber. 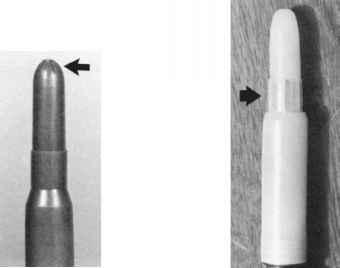 In plastic training ammunition, the plastic bullet is integral with the plastic case (Figure 10.19). On firing, the plastic bullet breaks free of the case. 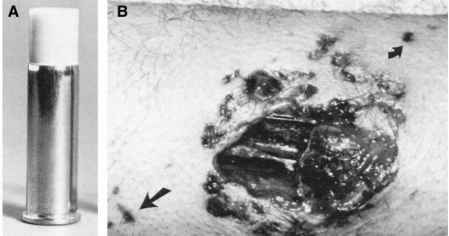 The rifle projectiles have a muzzle velocity of 1280 m/sec with a maximum range of 300 m.
Figure 10.17 (A) .38/.357 Speer shot cartridge; (B) gunshot wound of arm from .38 shot cartridge. Arrows indicate marks from plastic casing. Figure 10.18 Plastic blank with Figure 10.19 Plastic training round. breaking points on top. Arrow indicates where bullet breaks free from case. Although plastic blank and trainingammunitionare rarelyencountered in the United States, there is a form of plasticammunitionmanufactured domestically. This ammunition, manufactured bySpeer, consistsof a reusable red plastic case and a black cylindricalplasticbulletthatusesalargepistol primer as the sole propellant. Muzzle velocityof theplasticbulletisapprox-imately 500 ft/sec. This ammunition is intendedforindooruseatclose range. 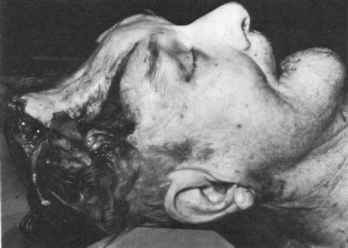 Test firings with the .38/.357 version of thisplasticcartridgeoncadaversat ranges varying from contact to 20 ft showed that the plastic bullets were incapable of penetrating the skin, let alone the body.9 The wound inflicted, which was limited to the skin, consisted of a superficial, circular laceration with a diameter approximately the same as that of the bullet. Although incapable of penetrating the body, this ammunition probably can cause severe injury to the eye.